For over a decade, work on Formal Concept Analysis has been accompanied by the development of the Toscana software. Toscana was implemented to realize the idea of Conceptual Information Systems which allow the analysis of data using concept-oriented methods. 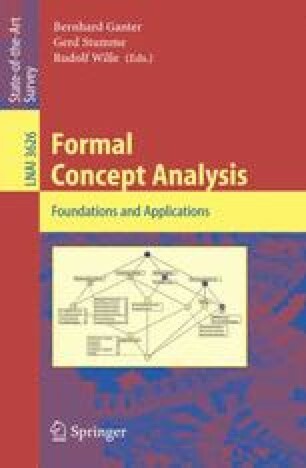 Over the years, many ideas from Formal Concept Analysis have been tested in Toscana systems while the real-world problems encountered led to new theoretical research. After ten years of development, the ToscanaJ project was initiated to solve some outstanding problems of the older Toscana versions. The ToscanaJ suite provides programs for creating and using Conceptual Information Systems. The experience with older Toscana implementations has been applied to the design of the programs. A workflow that developed through many Toscana projects has now been integrated into the tools to make them easier to use. Implemented as an Open-Source project and embedded into the larger Tockit project, ToscanaJ is also a starting point for creating a common base for software development for Formal Concept Analysis. In this paper, we present the features of the ToscanaJ suite and how they can be used to implement Conceptual Information Systems.